Creator of LATERAL concept and Founder of LATERAL brand. 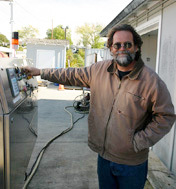 Considered one of the top Bordeaux style winemakers in the state. Son of Kathryn Kennedy and 40y veteran of the wine business. Brings extensive experience Bordeaux red winemaking; having personally made Merlot of Cabernet Franc lots from more than 25 vineyards from thoughout California. Advocate of multi-source blends and moderate extraction methods, Mathis was among the first in the modern movement to label a Napa Valley as “Made with Organic Grapes”. Certified as such in 2009 by the CCOF. Advanced Organics winemaking practices. For over fifteen years, he has skillfully crafted Lateral, bringing out the greatest possible synergy from these traditional varieties. We seek out and purchase exclusively from growers who adhere to sustainable vineyard practices; specifically those who maintain full certification as growing organic grapes. Approved winery methods include extensive record keeping, measure to eliminate co-mingling with non organic wines, detailed equipment cleaning protocols and prohibit the use of GMO additive or winemaking products. California Bordeaux style red wine.